Plot Tatie Danielle is a black comedy about a widow who is intent on ruining the lives of her great-nephew and his wife. Tsilla Chelton plays the title character, who mourns the death of her husband by tormenting everyone she meets. Eventually, she moves in with her nephew and his vain wife. Soon, her family is at war with Tatie, and takes off for Greece, leaving her in the care of Sandrine (Isabelle Nanty), an au pair who is as equally bitter as Tatie herself. At first the two don't get along, yet the two eventually become friends. However, Sandrine is invited to accompany an American student for an overnight stay at the beach, which would leave Tatie alone for a night. Angered, Tatie fires Sandrine, and while she is alone, she goes into deep depression, eventually setting the family's apartment on fire. 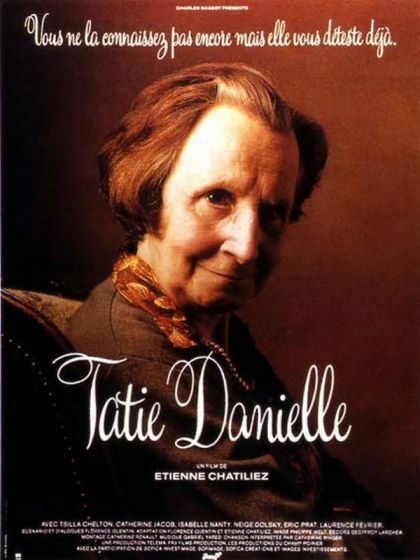 The fire becomes a national story, with Tatie cast as a poor old lady and the family labeled as cruel and heartless villains.